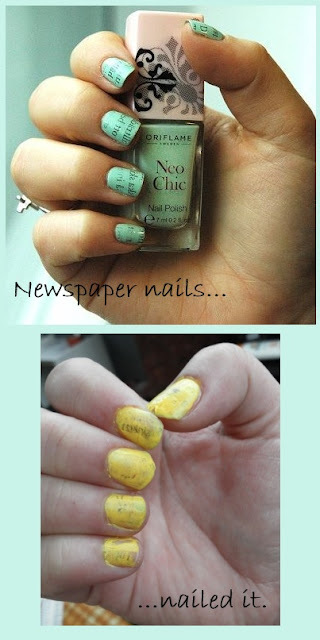 "Newspaper Nails.Wash the hands, apply one layer of Base and Top Coat.Let it dry.Apply 1 or 2 layers of nail polish.Let it dry.Rip small pieces of newspaper.Dip the nails in Anit-bacterial Hand Gel,apply the pieces of newspaper to the nail,press lightly and hold for a few seconds.Peel off the print and repeat on all nails.Finish with a layer of Oriflame Beauty Crystal Base and Top Coat." First the thumb. That's the largest canvas so your possible fails show off more clearly. What did I learn: I should make time and effort more often to test the pins and other various things I plan to fulfill. Even if it doesn't work out, I'll have fun planning and making them. Live long and prosper! OK, I got the nerd joke. Thanks for testing this, now I don't need to! I LOVE your kitty photo!! You are lucky they were ignoring you- mine would have been all up on the table, knocking over the nail polish! Haaa! I tried that one too and it turned out about the same! ;) Thanks for participating! I think I see more failed attempts at nail polish pins than successes. Makes you wonder if it's a single super nail polisher posting them all. Great pick on the sunny yellow nails though. My friend got it to work, and she is the only one i know so far in person. She used really junky vodka tho? Maybe that's the trick?